Can AppleScript or any other script measure a Macbook's wifi signal strength? At my home I have two separate routers due to poor signals when being in one location opposed to another. When I work on my Macbook from different locations I find it annoying when I have to switch between routers. The eventual goal is to run a more complex script under launchd to identify if a better networks is present and automate the change over. I've tried experimenting with networksetup -listnetworkserviceorder and networksetup -listallhardwareports but have had no luck. In AppleScript or any other scripting language a way to measure two router's strength similar to what's visible on the menu bar's wifi signal? Your Mac can do that for you already. Of course you have to have set up both routers as Automatically Join and at the top of your list. Then tell it to roam and it will automatically connect to next stronger signal network. Even better is if your SSID and WPA are the same for both. You are done, now you can move around and your Mac will keep you connected to the strongest signal. Here, the RSSI values are negative numbers, with a number closer to 0 (more positive) indicative of a stronger WiFi signal. Yes - both the current network and potential networks can be scripted from unix command line / shell so that extends to most automation languages - including AppleScript. I'd make your final program in python or swift, but here's how to start your process with signal strength. Getting the current connected network is easy and quick. The relevant entries for signal and noise are the raw radio values on the channel negotiated but it would be better to key off Transmit Rate since as long as you have faster than X network, it doesn't really matter what noise / signal since the transmit rate drops down when the signal drops or the noise raises. Once you've scanned, the system_profiler should report more results as the scan results seem to be cached locally for a while. WiFi engineers perform this optimization all the time by controlling the MCS / Transmit rate. Simply choose all transmit rates you wish to evict all clients for your main radio and once they lose connection at the preferred high speeds, all OS will drop and then pick up the next radio that's available. Much easier than rolling out custom scripts to all the devices that connect to your two radios. Also, it goes without saying - if you could make both radios broadcast on the same SSID - then your Apple products would just roam but maybe you have a good reason to not have the same network name and simplify your work. 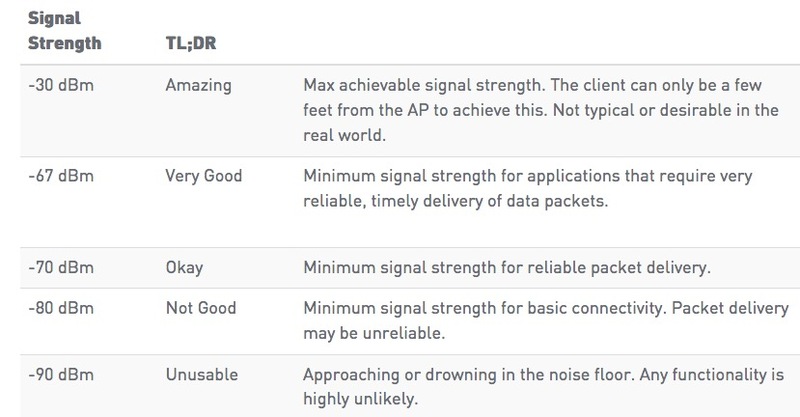 And to answer @nohillside question "how to decide which Wi-Fi is stronger" here are some guidelines. Not the answer you're looking for? Browse other questions tagged macos network applescript wifi automation . What OS X signal strength test apps exist to measure Wi-Fi networking? How can I write an AppleScript which when run will connect to a specific WIFI network if available? How can I use Applescript or any other utility to send a daily text message to my bank? On my Mac, can I measure how much the frequency of a WiFi signal changed between the time it was emitted and the time it was received? How can I diagnose what is interfering with my Wifi signal? Can AppleScript display when a script was last run? How can you active the Script Menu Bar with AppleScript?